Those two words are identical, and there are no spelling errors. It’s actually someone at Google’s idea of a funny private joke. 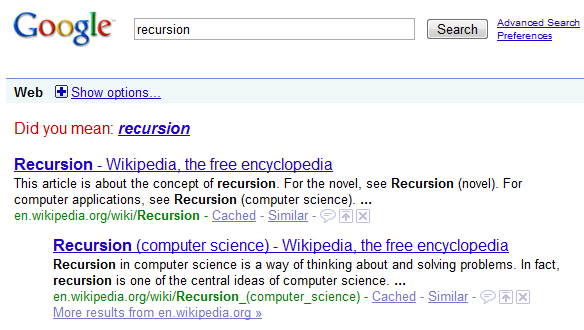 You see, the word ‘recursion’ is a mathematical term that means “the application of a function to its own values to generate an infinite sequence of values.” If you were to click on Google’s suggested word each time, you would be creating an infinite loop of searches. Recursion (which is related to the word ‘recur’) is kind of like when you hold two mirrors side-by-side facing each other - they form an infinite visual field of reflections.